Tao Massage | Far Infrared Sauna - the deep sweat sweet heat treat! Far Infrared Sauna – the deep sweat sweet heat treat! Sweat once a day – BUT make it DEEP sweat. Deep sweat comes from using the FAR INFRARED SAUNA. You can sauna once a day, twice a day or once a week! Far Infrared Sauna (FIR for short) provides radiant heat, gently warming the one’s body directly. In this way, a deep penetrating heat warms the body from the inside out “pulling” toxins from subcutaneous fat storage directly into our sweat. Far-infrared begins emitting as soon as the sauna is turned on, while the temperature rises from 100f to 135f, generally within 30 minutes. 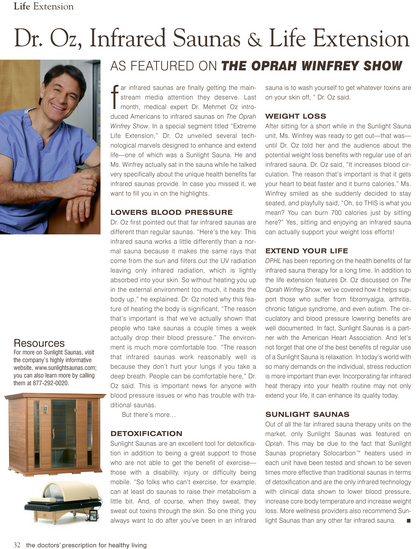 Even Dr. Oz weighed in on the beneficial effects of Infrared Saunas and life extension and specifically talked about Sunlight Saunas, the type of sauna you will find at TAO. Regardless of the cabin temperature, far infrared is still being emitted and providing a therapeutic effect. Upon reaching 150f, the sauna starts cycling off and on, limiting the amount of far-infrared rays. Therefore, keeping the cabin temperature lower can have more benefit. WHAT ABOUT A REGULAR SAUNA? Electric or wood-fired conventional saunas may reach as high as 200f, at temperatures this high, toxins can be, drawn back into the bloodstream and cause unpleasant reactions. Some people need several sessions before they begin to perspire. When beginning to sauna, many people do not easily sweat. Instead, their bodies overheat and they tolerate less time in the sauna. However, we gradually start you out at the recommended temperature of 110-125 degrees. In a few weeks to a few months, one acclimates to sweating and is more able to regulate one’s temperature. Sweating generally increases over a few months. Also, the more one relaxes, the more one will sweat. At TAO we were pleasantly surprised that one of our clients told us her doctor recommended FAR Infrared sauna. We were quite surprised by this and questioned her if she was SURE he said FAR Infrared. She enough she said yes, “my doctor recommended far infrared for my fibromyalgia and arthritis.” YES!! HOW MIGHT I FEEL AFTER? Healing does take place with use of the FIR sauna. Reactions are temporary and may occur as toxic substances are eliminated and chronic infections heal. Symptoms may vary from mild odors, tastes or rashes to periods of fatigue, bowel changes, aches, pains or headaches. As chronic infections heal – they may flare up a due repeated sauna use until they are gone form the body. Emotional healing also takes place. Memories may arise consciously or in dreams. Temporary anxiety or other emotional states may occur and usually pass quickly. Some are directly related to elimination of toxic substances. Others are associated with emotional clearing. WHAT CAN I EXPECT AT TAO? HEAT sessions are full service. Showers, towels, robes, water, hot towels and organic amenities from organic body washes to shampoo and conditioner to enhance your sauna experience.Our Sunlight Sauna we like to call the “bliss tube” as you will lay down on our massage tables and rest comfortably surrounded by the sauna shell tube tops which have infrared panels in them as well as laying on infrared panels on the table. You will have a personal Wellness Assistant prep you for your sauna and answer any questions you may have. Showers are available post sauna or hot towels if your prefer not to shower. It is best t take a warm, not hot, shower. You may read other information about NOT showering with soap as leaves a film and clogs the pores – however at TAO we use NON CLOGGING organic body washes and massage cream so you can feel confident that you skin is only being fed the best ingredients! I.E. NO CHEMICALS to clog the pores. Drink eight ounces of water, provided, and sit or relax for 15 minutes more to get the most out of your session. For even more in depth information as we can go on and on…The Bowan Therapy Clinic has listed extensive information about the use of Far Infrared Sauna.